I approach my work rooted in a deep respect and appreciation for the classical principles and methods of creating mosaics. When a client requests a reproduction of an ancient mosaic, I pay exacting attention to the details of every aspect to produce as authentic a reproduction as possible. In contemporary works, while I may use the same centuries-old design principles that continue to be effective in the fabrication of mosaics today, I strive to develop these methods in new and sometimes innovative ways. A commission begins with a discussion between the client and I about the client’s idea for a piece of artwork or installation, and any visual materials they may want to provide me to work from such as photos, sketches, etc, I then will asses the project and give them an estimate of the cost. This figure comes from several considerations, including designing, size, complexity of the subject matter and hours spent to create the work. Clients are also welcome to come with a specific design already desired, and in this case are only charged for the fabrication. 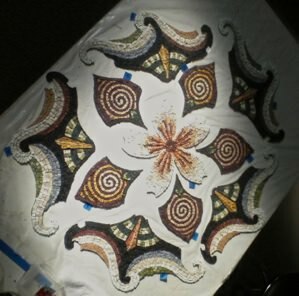 The mosaic is rendered in my studio by hand-cutting and laying each tesserae . I provide email image progress reports, but the client is also invited to view this meticulous and wonderful process at any time during the project. 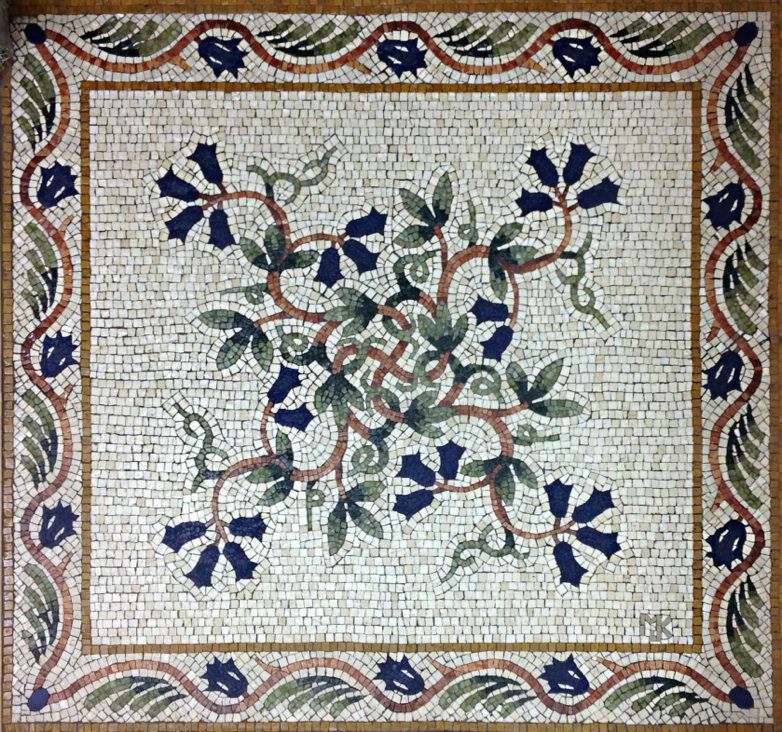 Following are some common Materials used in mosaic work indoors and out. "Still Beating" Hearts for San Francisco Benefit for San Francisco General Hospital Trauma Center- !! !Installed Linked in building-222 2nd St. San Francisco!!! A dense and brilliant Venetian glass originating in the Byzantine period; smalti is typically seen on the walls and ceilings of your favorite cathedrals in Italy, Turkey, Greece and Sicily. 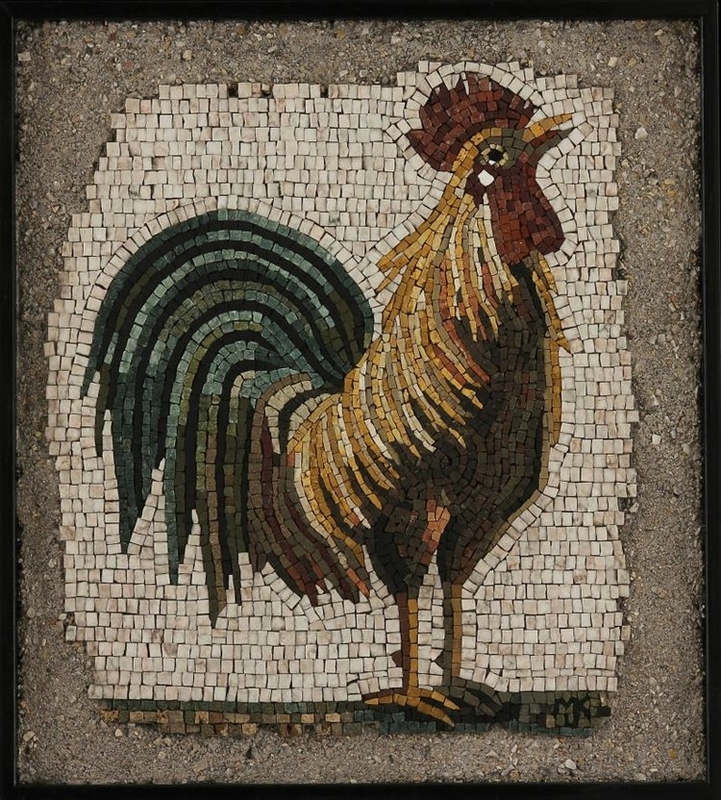 It is widely used today by professional mosaicists for vibrant, rich works of art. Suitable for walls, ceilings, and more but not often used in floors. 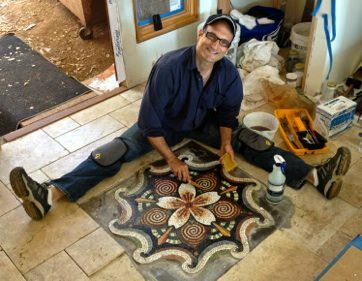 Below are photos of some of the many methods I use for floor, wall, and hanging fine art mosaics. Dimensions and prices are listed below a few to give you a sense of each commission's budget range. 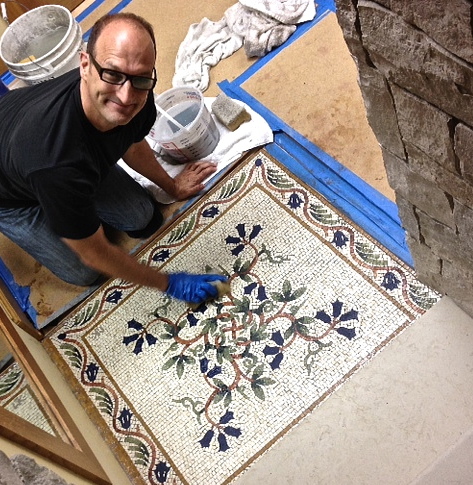 Mosaics are very labor intensive and can take weeks and months to complete. Time and cost will vary depending on the project. 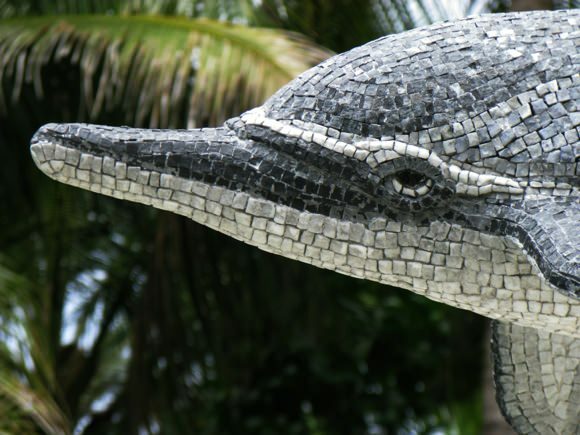 There are several factors that contribute to the cost of a custom hand-made mosaic; size of mosaic, level of complexity of images or designs, size of the hand-cut pieces (tesserae), and materials are a few. First Consultation is free. Your package price will include /Design/ Construction/ Installation and Care instructions for your investment. 7-Pointed Star Planter Top, 20127, Stone and Gold, 26" x 26"